Sometimes you just have to sleep on it. And then suddenly, the solution is obvious. 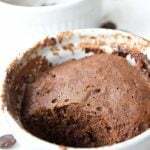 This is exactly what happened with this chocolatey Keto mug cake recipe! After making this rather delicious sugar free lemon mug cake, I decided I needed a chocolate counterpart. Firstly, because mug cakes are my new passion, and secondly, because chocolate is one of my oldest, dearest friends. 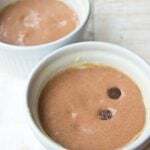 At the end of the afternoon I had produced no less than five versions of a chocolate chip Keto mug cake, all of which were kind of delicious. I had even shot a video. My family was quite happy that dessert was ready before dinner had begun and insisted that all cakes were great. But. I knew they could be better. Friends, you know I am a food nerd. There I was lying in bed last night pondering which ingredient I could add to make my chocolate mug cake AWESOME. And then, at roughly 5:29 am I knew what it was: I didn’t have to add anything. I had to take something away! Let me give you full disclosure here. In my original recipe I had settled on 2 tbsp coconut flour. It produced a pretty-looking cake which stayed soft and delightfully spongy while warm, but firmed up too much for my liking when cold. Whilst still yum and certainly nourishing, I was after a moister specimen. Simply by reducing the amount of coconut flour to 1 1/2 tbsp, the cake came out just perfect! The cake looks a bit soft when straight out of the microwave. Resist the urge to blitz it for another 30 seconds. It dries out easily! If you want to turn it out onto a plate, wait until it has cooled a little so it does not fall apart. Make sure you level your tablespoons of coconut flour to use the correct amount. Coconut flour is terribly absorbent, that’s why it took me so many tries to get the ratio right. Stir your dry ingredients really well, to ensure there are no lumps. I couldn’t find a sieve, so simply pressed it with my fingers, which was kind of fun. My batter was way softer using only 1 1/2 tbsp of coconut flour than the one you see in the video. There is a photo of it in the recipe instructions! The chocolate sauce is optional, but yum. I haven’t included it in the recipe calculation. Alternatively, you could eat this cake with sugar free ice cream or some whipped cream and berries. You can either use ready-made sugar free chips like Lily’s or simply break 90% chocolate such as Lindt into small pieces. 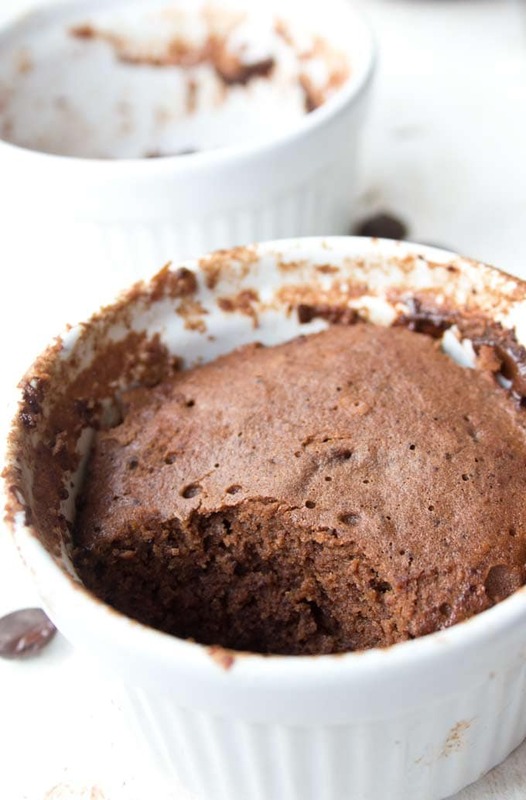 A moist and chocolatey keto mug cake made with coconut flour. 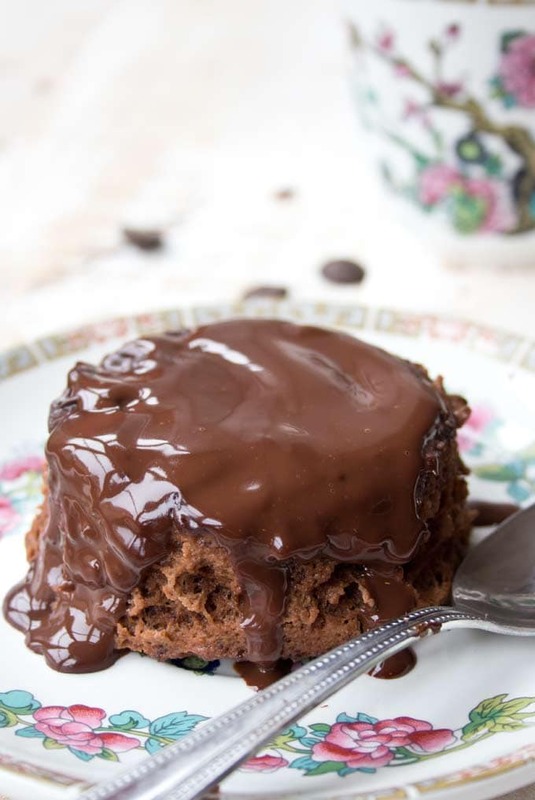 Enjoy this cake straight out of the mug or transfer onto a plate and smother it with chocolate sauce! Sugar free, low carb, gluten free. 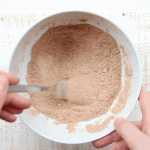 In a bowl, combine your dry ingredients - coconut flour, baking powder, cacao powder, sweetener. Make sure there are no lumps. Add your wet ingredients - the egg, cream and vanilla extract. Mix well. Stir in the chocolate chips and let the batter rest for a minute. Melt 1/2 tsp butter each in 2 mugs or ramekins (30 seconds) and grease the insides. This is an important step if you want to turn your mug cakes out onto a plate. Divide the batter between the mugs/ramekins. Microwave on high for 1 1/2 minutes. Don't microwave any longer or your cakes will become dry. Enjoy straight out of the ramekin or turn out onto a plate. See notes for an optional chocolate sauce! 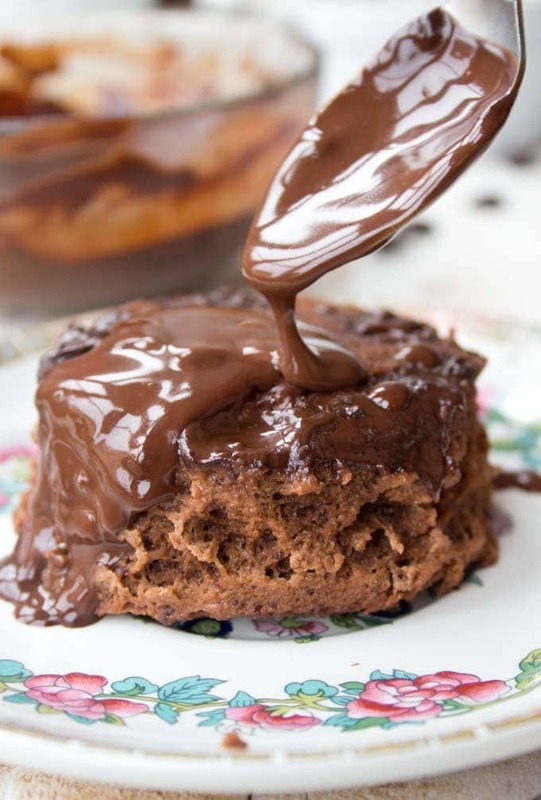 For an optional chocolate sauce, melt 2 tbsp sugar free chocolate chips and 1 tbsp butter. I like to start them off in the microwave (30 seconds, no more) and then put them in a water bath (place a small bowl with the chocolate chips into a larger bowl filled with boiling water). Stir until liquid. Add 2-3 tbsp cream or milk and stir until smooth and pourable. 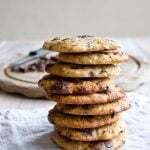 If you cannot get hold of sugar free chocolate chips, you can use very dark chocolate instead, with a minimum of 85% cocoa solids and break it into small pieces. I've done that for my chocolate chip cookies and it worked well. Even better, make your own sugar free chocolate chips! I like to use cacao powder instead of cocoa powder. Cacao powder is unprocessed, which means it retains important nutrients and antioxidants. 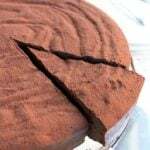 If you are using cocoa powder, which is stronger in taste and darker in colour, you may have to halve the amount stated in the recipe. I used classic ramekins just like these. 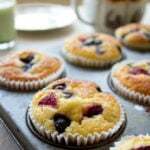 They are great for making little cakes and they're perfect for my Low Carb English Muffins, too. My favorite mug cake so far. YUM! I added a small dollop of no-sugar added red raspberry jam – and it was just perfect. Thank you so much for this. Raspberry and chocolate are a GREAT combo 😉 Glad you like the cake! I’ve made this mug cake over 10 times! Absolutely the best mug cake ever!!!!!!! I use a tupper ware bowl for a mini cake, and eat the little slices. This cake is delicious! Thank you for perfecting this! Deliscious! I sprinkled some sukrin gold on top and torched it which gave it a delicious crunchy sugar topping. I had been making a mug cake with almond flour that I really like but I ran out. So I found this one to use up some coconut flour. This one is more cake like whereas the other one is more brownie like. I added a big dollop of peanut butter to the top before cooking. It sunk inside and got all melt-y. Yum! 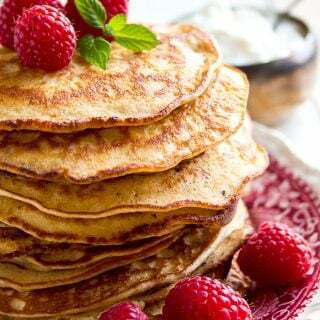 Great recipe and cured my sweet craving! 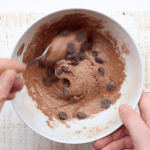 Havent done this yet but LOVE mug cakes – just for me. at the risk of putting anyone’s nose outta joint- are you aware of Gemma’s Bigger Bolder Baking site. her site is just about baking/desserts and the ‘basics” which are great. I love all of her mug cakes but cant eat them anynore because of the keto diet. 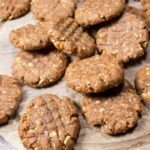 She is trying to add in more keto baking and I think you two should collaborate. have yet to be disappointed by any of your recipes. keep it up. Gracias. Just made this but had no cacao powder or cocoa so I blended a heaping Tbs of cacao nibs in the Nutribullet. They didn’t blend to a fine powder but it worked & gave the cake a nutty texture. Also the color was nowhere near as dark as yours. For the sauce I used two ghiradelli 86% squares stirred into a TBS of melted butter with a dash of truvia and a splash of heavy cream. It tasted sweet & salty (maybe from the baking powder?) & delicious! Great idea to blend the cacao nibs! 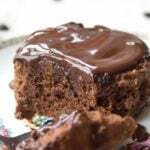 Dear Katrin, I have tried several grain-free recipes for desserts before and they were too dry! But it looks like you have solved that problem with the cream! I plan to try it soon! Let me know how you get on Chuck! This is fabulous! I used a mix of stevia and swerve (my tummy can’t handle too much swerve) and poured some chocolate sauce on it. I felt like I was eating regular chocolate cake. Next time, I’m going to try subbing coffee for one of the tbs of cream. Thank you for a great recipe! I love this cake and my family too. I put orange essence instead of vanilla as i love chocolate orange mix. Please in the macros has the fiber already been subtracted? What is the net carb for each serving? Maybe you could use mayonnaise in place of the heavy cream? I’ve never tried this, but it’s a similar consistency. I’m not seeing the recipe for the chocolate sauce. Where do you have it posted, please? 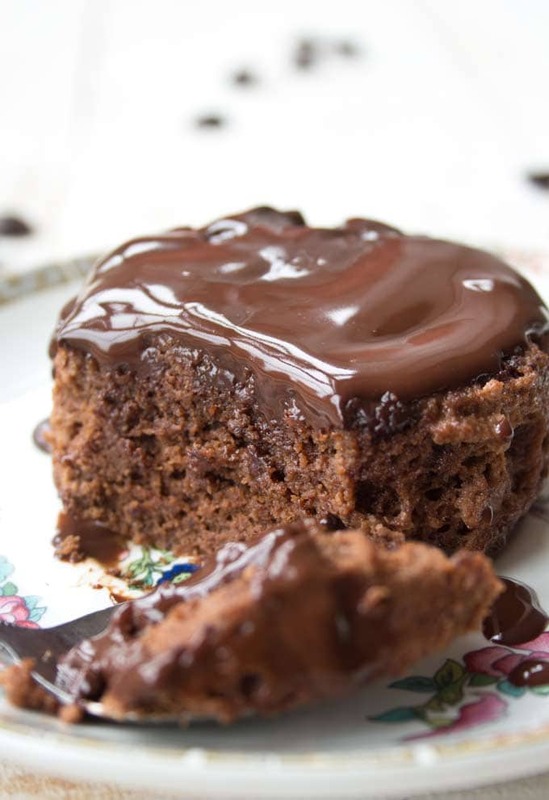 Hi Jennifer, it’s in the recipe notes – I’ve copied it here for you: For an optional chocolate sauce, melt 2 tbsp sugar free chocolate chips and 1 tbsp butter. I like to start them off in the microwave (30 seconds, no more) and then put them in a water bath (place a small bowl with the chocolate chips into a larger bowl filled with boiling water). Stir until liquid. Add 2-3 tbsp cream or milk and stir until smooth and pourable. 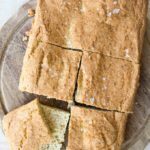 I have not been a huge fan of coconut flour desserts in the past…always seemed a bit too “cotton-y” and lacked richness. You have made me “eat my words” (right after I finished every crumb of this great little cake). 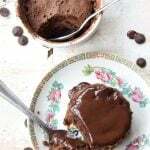 These chocolate mug cakes were simply terrific. Non low carb-ers would be hard pressed to tell the difference between these and a traditional chocolate cake. Wow. Really loved them. Fluffy, moist and decadent all at the same time with a reasonable calorie count. I had planned on just adding a bit of whipped cream but when I stole a tiny bite waiting for them to cool….had to switch to the chocolate sauce as they were just too fabulous warm to wait to cool to be able to do the whipped cream without it just melting. Huge thumbs up on this one…..well done! I had another recipe for chocolate mug cake, but it was bland and didn’t suit a craving for chocolate. So, I hunted around and found this one. I love it! It has a strong chocolate flavor with a perfect amount of sweetness. I made a cream cheese frosting and dabbled it on top and then sprinkled it with salted pecans. Truth be told, I never ate this well prior to being on low carb!!! I guess the chips sunk to the bottom of the ramekin while it was resting because when I flipped it over, some of the chips stuck to the bowl. Any suggestions? Other than that, it was perfection. Thanks for all your hard work. I appreciate it. Glad you like the recipe! Not sure about the chocolate chips – maybe next time stir them in only at the top? I just want to say, wow! I made this, for the first time today…it tastes amazing!!! Even my husband, who isn’t Keto, really liked this recipe. I did not have the heavy cream and substituted 2T of unsweetened vanilla almond milk and 2T of olive oil. Thank you for sharing this. I had been eating the chocolate Quest cookies when I had a craving…but this is better and no processing!!! LOVE!!! So glad you all liked it Gina! I like your substitution of olive oil! OH MY GOSH! I swapped two of the tbsp of heavy cream for SOUR CREAM instead and it not only did not dry out when I cooked it for 1.75 minutes, but it is so moist and delicious! I also whipped up heavy cream with warmed cream cheese, liquid stevia, and peanut butter to make a sauce! So good! I was sceptical at first, until it was cooked! It turned out so Yummy , Fluffy & Moist! Will definitely make it again & Jazz it Up with a Peanut Butter Sauce. Otherwise it’s so good on its own! 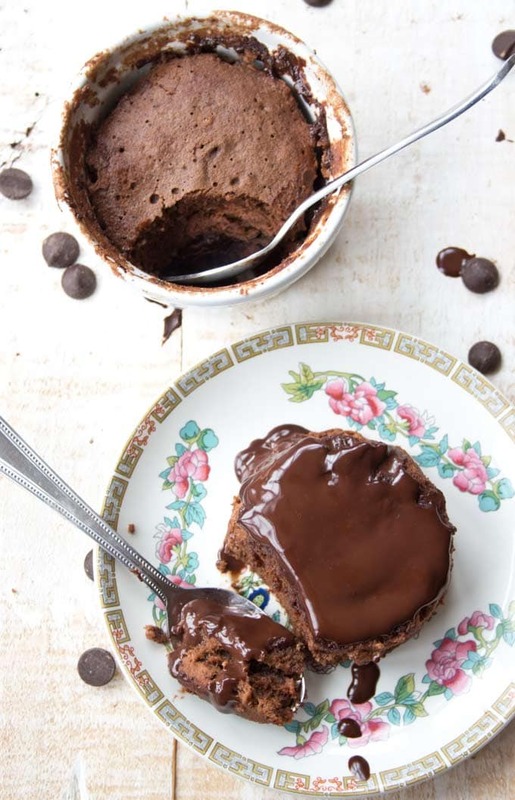 Great Keto Chicolate Cake In A Mug! This recipe turned out perfectly on the first try! The batter was really thin and was afraid it wouldn’t raise correctly but that wasn’t the case. I cut down the cocoa to 1.5 TBS as you recommended since I didn’t have the cacao. I fallowed the rest of the ingredients as listed. Perfect little cakes the batter transformed into! How wonderful! I’m happy you enjoyed the cake; Thanks for taking the time to write such a detailed comment and for including your adaptations! Haha, coconut flour recipes are filling!!! Your frosting sound delicious. Glad you enjoyed the cake!! OMG, I love this recipe. It’s my mum’s birthday today, so thanks for this amazing recipe to be able to celebrate and eat a delicious cake keto style 🙂 I didn’t have cream, so I substituted with 2 tbsp each of olive oil and skim milk. I also only added 1.25 tbsp of sweetener and 1 tsp of 85% coco powder. It was so light and fluffy and delicious with fresh blueberries and raspberries. Yum! Thanks Katrin, I made a cake in a greased square pan with 5 times the recipe at 170 Celsius for about 35 minutes. It was great and a hit at work. I warmed the slices up in microwave before serving. Wonderful! Good to know it works!! Thanks for the tip! I didn’t have cream, either so i subbed olive oil and coconut milk. It was amazing! Thanks Katrin for the recipe and Divleen for the subbing tip! OMG! This cake is delicious! It certainly took care of my craving and more :))) Thank you for this great recipe. It’s a keeper! What is the diameter of the ramekins that you used? Thanks. My son is on keto. It’s been difficult finding a chocolate dessert he enjoys. BUT THIS…this was delicious. Even I enjoyed it and I’m not on keto. I sifted all dry ingredients and used a large egg. I substituted unsweetened cocoa powder for the cacao….same measurements. Topped it with a dusting of confectulioner’s sugar. Delish! What I love the most is the serving size and how quick it is to make. Thanks! That’s so good to hear! Thank you for taking the time to comment. The cocoa powder has a stronger chocolate taste than the cacao, so I’m sure that tasted great. May I suggest you add the oven cooking option in the recipe? It would be useful for people, like me, who do not use/have a microwave. This will curb my chocolate addiction with little sugar – a win-win. Thanks! If I only have large eggs do I need to adjust anything in the recipe? That’s a good question – probably not. I’d pick the smallest of the bunch and just make the recipe as is. If you feel the dough is incredibly liquid (like pancake batter) though you could add an extra pinch of coconut flour. Let the dough sit for a minute or so before you decide to do that though to give the coconut flour time to absorb liquid. can it be done in the oven cause i don’t have microwave what’s the timing and temperature thanks. Hi Carol, I’d try it at 180 Celsius / 356 Fahrenheit for around 12 minutes. Test the inside to see if it’s done! I made this as per the recipe and served it with mascarpone. Absolutely delicious! Thank you! 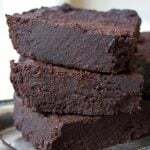 This is a delicious recipe, really moist and soft. I didn’t make a chocolate sauce this time because I did not have enough chocolate chips, but will definitely add it next time. Nevertheless, it’s great without too. One thing – do follow the advice to mix the batter well, maybe even sift it. I had a few coconut flour crumbles inside my cake. Thank you for your comment and your input Lorna! I’m glad you like the cake. I have made this cake three times in a row now. It’s so good! I used 1 large tbsp cocoa instead of the cacao and it worked a treat. Hi Janine, that’s interesting, now we know which amount of cocoa works. Thank you for trying the recipe – happy you’re enjoying it! This looks so good. I have coconut flour in the house, so I’ll try it out tonight! Hi Britta, I’d love to hear what you think of them once you’ve made them! 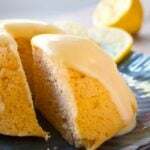 I recently tried your lemon mug cake and absolutely loved it. It’s so moist and tasty, just the best. Definitely making this recipe soon. 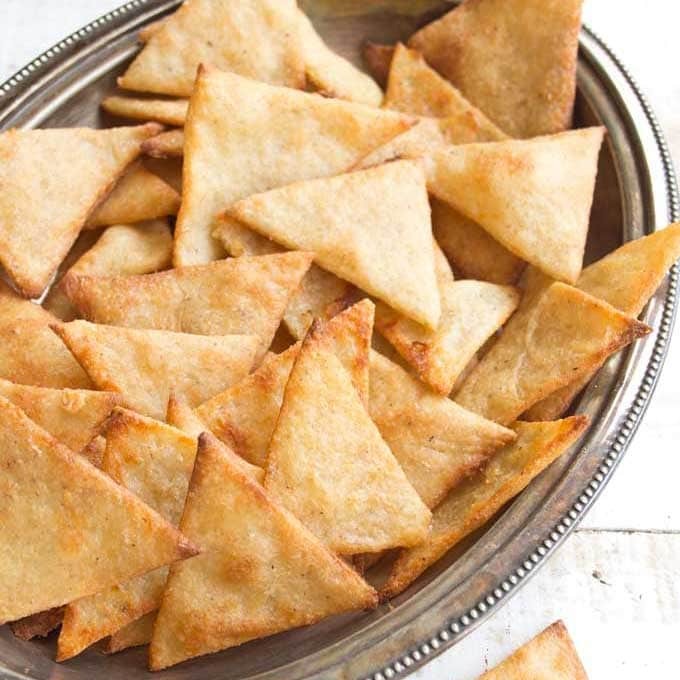 If I wanted to make it with almond flour, how many tbsp would you use? Oh, I’m happy you like the lemon cake. Regarding the amount of flour, I’d say probably 4 tbsp almond flour, maybe even a tiny more depending how coarse your flour is (an extra tsp?) 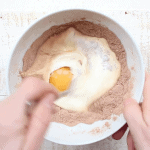 because this recipe uses more dry ingredients (the cacao powder). This is a great recipe! 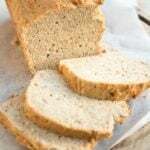 I actually made mine with 1 T almond meal and 1 T of the coconut flour and amazing flavor. I also substituted the cream for a blend of coconut & almond cream to be dairy free too! The sweetener I used was half monk fruit and half stevia…super tasty and fewer chemicals to contend with! Thanks for the start!